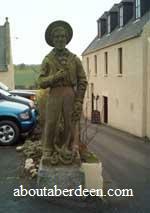 The statue was taken from France in the 18th Century by a former owner of the Meldrum Arms Hotel. The exact date is unknown. The monument is now listed along with the building. It sits proudly welcoming visitors to this lovely Aberdeenshire village.